This guy supported his GF to reach her dreams. What he receives in return was heartbreaking! Home / Love / This guy supported his GF to reach her dreams. What he receives in return was heartbreaking! Recently, a lot of videos showing the success of a long distance relationship is circulating online. Photos and videos somehow prove that LDR can still be done without any problem. However, this man has a different experience when it comes to an LDR. A man named Jayson Dale has recently posted a story on his Facebook account. On his post, he claims that he has been there for his girlfriend for quite some time and he has always been the most supportive person he could ever be. He claims that he wanted to support her in everything that she does, even if it means that she has to leave in Japan, while he stays in the Philippines. 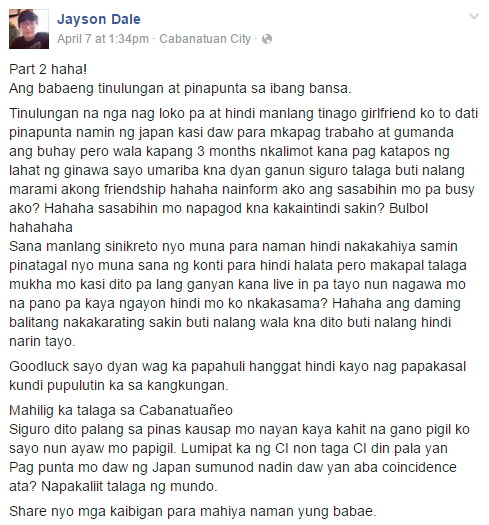 Yes, Jayson supported her dream to live in Japan. Little did he know that instead of giving back all the sacrifices that Jayson has done for her, she would rather cheat over him! However, just recently, the girlfriend of this man who was identified as Janet Faustino has already posted her statement regarding this issue. She claims that her life in Japan isn't as easy as what everyone thinks. She claims that Jayson has no right to judge her because he had no idea how much she suffered in the hands of Jayson's stepmom. 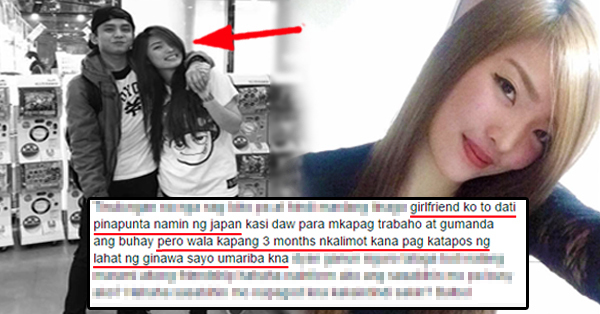 She also clarified that before she had a new boyfriend, she already ended her relationship with Jayson. This is indeed one of the hardest part of a relationship, where both of you has already given up, but then the anger still lives inside you.